As an independent telephone engineer in South Wales I offer cost-effective, highly competitive telephone engineering services. I am passionate about my business, responding quickly to customer call outs to deliver a professional and precise solution to your requirements. I specialise in solving issues with telephone lines, broadband services and wifi and provide a service that is not only cheaper, but faster than your service provider. A fast and effective service allows you to go about your daily business without interruption, essential in a society that needs to be constantly connected. Evenings or weekends I can visit at a time that meets your requirements. Don’t miss out on potential business opportunities or a days work and contact me to resolve your problems today. I don’t charge VAT for my services, providing you with additional savings, compared to traditional call out services. All of the work is completed using high quality equipment and consumables, ensuring the service provided is of the highest standard. However, as an independent telephone engineer consumables are charged to you at discounted prices. I don’t charge the extortionate and unnecessary fees typically associated with telephone engineer call outs. This approach is to ensure that the customer is pleased with the service provided, and if a friend of family member requires an independent telephone engineer you will recommend my services to them. As you can see from my excellent reviews and testimonials, customer satisfaction is extremely important to me and my business. 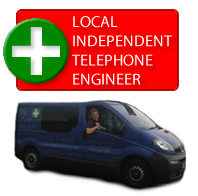 Independent telephone engineer services I offer include finding and repairing faulty lines , socket and telephone wiring repairs, data extensions, telephone extensions and more. I also diagnose, repair and upgrade services. All of these services are available to domestic and business customers. I frequently provide telephone engineering services for work residential, house builders, councils, schools and housing associations. In addition to independent telephone engineer services, I also provide broadband and wifi services to help you get back on line. I can significantly improve broadband speeds, allowing you to work more efficiently and diagnose and configure wifi issues to allow you, your colleagues and family members to remain online from your laptop, tablets and other portable devices. If you are in need of a telephone engineer or require broadband or wifi services call me to save time and money. Get back on track with efficient, friendly and cost effective engineering services, call me now on 0777 1822 206 or email me at thedoctor@thephonedoctors.co.uk.